The college I attended in Houston, the University of St. Thomas, was also populated with these images of Jesus and the saints, including its namesake, St. Thomas Aquinas. One March day, five years after I graduated, a new image of St. Thomas came to tower over the campus life mall at the university in the form of a beautiful and vibrant 30-foot-tall graffiti mural. Gonzo’s work includes the iconic “Houston is Inspired” mural that has become a landmark in downtown Houston. The mural, which had a reveal celebration on March 21, was created by Mario Figueroa Jr., a native Houstonian whose art is featured across the city. His work includes the iconic “Houston is Inspired” mural that has become a landmark in downtown Houston. 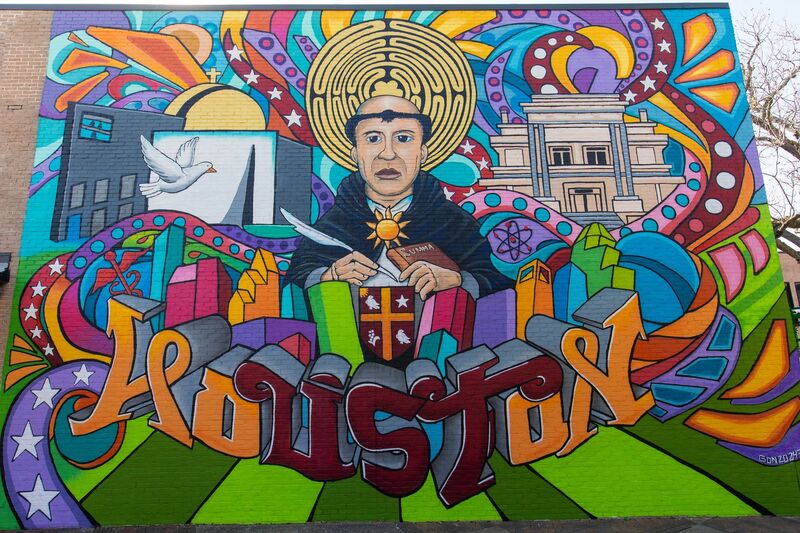 Figueroa, who goes by the name GONZO247 for his artwork, rendered St. Thomas, a 13th-century Italian Dominican friar and doctor of the church, behind an outline of the downtown Houston skyline and the name of the city. An abbreviation of the school, U.S.T., is highlighted in red script. The figure of St. Thomas is flanked on either side by drawings of the Chapel of St. Basil and of Link Lee Mansion, which houses the office of the university president. The saint’s halo resembles the walking labyrinth that is adjacent to the chapel, itself a replica of a labyrinth on the grounds of the cathedral in Chartres, France. Chris Valka, C.S.B., a member of the Basilians, the French order that founded the school, and the university chaplain, said students and staff members at the university had always been interested in a mural. He said that the final design, along with the choice of artist to paint it, were great ways to highlight the bold moves the university was making. One day when he was 11 or 12, he picked up a spray can, found a piece of plywood and started painting. After a few moments, he was sold. The 46-year-old graffiti artist was first introduced to the art through rap. He discovered hip-hop culture through rap music and calls graffiti the “visual language of hip-hop.” He also remembers the instant he knew he wanted to be an artist. He was around 11 or 12 years old, messing around in his dad’s garage in Houston. He picked up a spray can, found a piece of plywood and started painting. After a few moments, he was sold. As he grew up, the mural became for him the identity and anchor of the neighborhood. “The scale of that production really left an impression on me. [I knew] that was the direction I wanted to go in life,” Gonzo said. The mural is a part of the #BeYourBoldSelf campaign, aimed at highlighting the diversity and uniqueness of the university and its students. Gonzo also believes in the positive impact public art can have in a local community when you take the time to engage with residents. The church’s positive relationship with the arts is something the university wanted to feature. These same desires led Gonzo to the University of St. Thomas, where his sister worked and studied as a student, and to create his portrait of the tonsured, black-cloaked Aquinas. The mural is a part of the #BeYourBoldSelf campaign, which the university launched six months ago to highlight the diversity and uniqueness of the university and its students. Father Valka also mentioned how the church’s positive relationship with the arts is something the university wanted to feature. “It’s through art that we are often led into a deeper understanding of God,” Father Valka said. Reforming the Vatican Curia has been a goal since the Second Vatican Council, but so far the changes have failed to improve its efficiency or responsiveness. Pope Francis is trying again.